One Liner Review: a criminal mystery that ends with a cool twist, but is all pretty one-noted up until then. 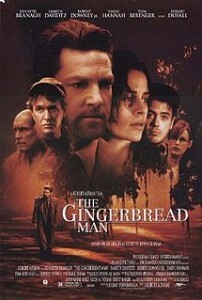 The Gingerbread Man is a movie that is built around a twist ending. that’s a bad way to make a movie, because what it means is that everything that happens, occurs in order to setup the ending and only so that the ending can exist. it also means that if you know the twist of the movie (if you’ve seen the movie before), or if you can just predict it (and it’s really not that hard), then you are going down with the ship. it’s a good twist in the sense that it really does change everything, but it takes a long time to get there, and puts us through a lot just to make it happen. he starts seeing her more and more, and walks into a few more of her father’s threats and horrific actions, such as hanging her cat right inside the front door of the house. rick gets his friend and private detective, clyde, to help, and together they get mallory’s father, dixon doss, (Robert duvall), locked up in a mental institution. only his friends, a bunch of old hillbillies, bust him out, and that’s when the real threat begins. this real threat is against rick. 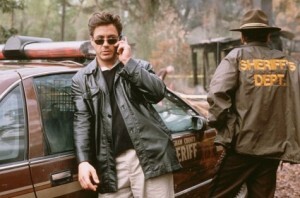 in a cape fear-like way, doss now has it in for the lawyer who put him away. he sends photos to rick with the eyes of kids cut out of them and rings the doorbell to where he’s staying before disappearing. it’s all to scare and intimidate rick and it works. the next thing you know, rick is rushing off to his kids’ school and snatching them out of class in order to keep a watch on them and protect them. he’s divorced from their mother (famke jansen), and he’s not legally allowed to pick the kids up, so the school and a janitor try to stop him. that’s when rick gets physical and hits the janitor and becomes a sort of outlaw, one man trying to defend his family and taking on anyone who gets in his way. the stakes quickly get even higher when rick and his kids are staying at a hotel and he goes to use a pay phone. a truck pulls in front of his view and his kids end up getting kidnapped. now rick is freaking out and he gets back with mallory and clyde in order to find out where doss might be living. she leads him to a cabin where he finds and takes care of doss. now we’re in the final part of the movie, and the twist ending starts to come out. once it hits, it seems kind of obvious, but up until this point, if we haven’t figured it out, than it’s been a pretty enjoyable ride. rick has got himself mixed up with a femme fatale and seduced by a stranger and then has found himself getting completely involved in her problems. and not too long afterwards, she is no longer the target of her father’s threats, but now he is. instead of photos of her with the eyes cut out, now they’re photos of his kids. the stakes have been upped. part of the problem with this movie is that it is completely one-noted. it moves the entire time in just one simple direction, with the threats building up and rick getting more and more on the edge. the movie was written by john grisham and directed by robert altman, and while those two are both major talents in their fields, this is hardly one of the better things either one of them has turned out. for grisham, his books had been turned into movies for the past five years, and they were all doing really well. first was the firm with tom cruise, then the pelican brief with denzel washington and julia roberts. that was followed by the client and a time to kill. grisham decided to try his hand at screenwriting, and trying to make a story with the intentions of it turning into a movie. that became The Gingerbread Man, and it is way too one-dimensional. the characters aren’t fleshed out the way they usually are in his work. just look at a time to kill and the way that we learn a lot about every single character. here, the only one we really learn about is rick. the storyline is not only one-noted, but also makes a number of obvious mistakes. rick might lose the kids when he goes out to the pay phone, but in the scene right before that, he let them go into a candy store all by themselves. so clearly, he is not watching out for them at all. and when they are returned after being kidnapped, nobody bothers to ask them what the man looked like who kidnapped them. that would probably be one of the first questions they would be asked, right after, “are you okay?” robert altman, also, was not the director that he used to be when he made this movie. yes, he was used to working with big name casts, and he sure got one here, but this it’s hard to believe this is the same expert on film noir who once made the long goodbye. the movie takes place in savannah, georgia and is just slightly better than the last film noir i saw that was set there, midnight in the garden of good and evil. at least this movie has one note to play and a single direction, whereas that one was all over the place. there’s also some cool use of a tropical storm here that plays out on news broadcasts and in the background throughout the film. that adds to the atmosphere, but the storyline has too many problems to keep this movie afloat.